The Comisión Nacional de Hidrocarburos (CNH) granted TGS the authorization to carry out a regional multi-client seismic data reprocessing and integrated geologic and seismic interpretation of these regions. 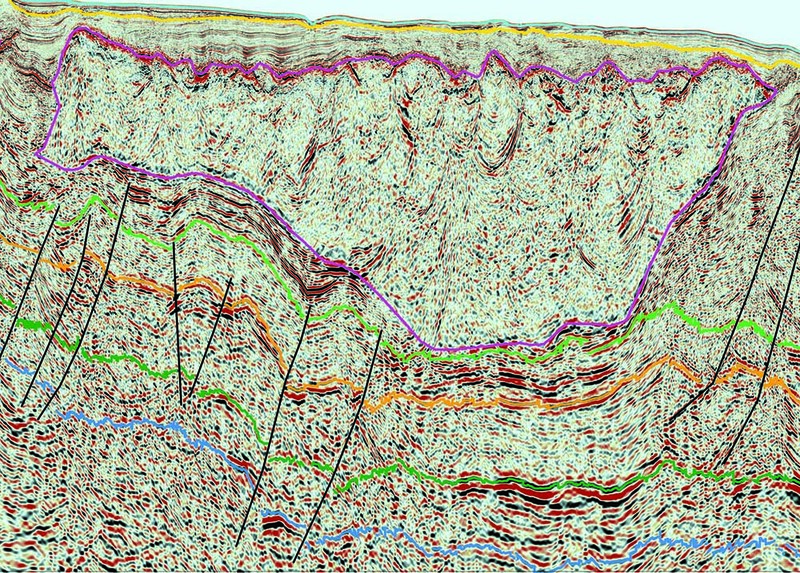 TGS provides the industry with over 40,000 km of 2D seismic data within the Veracruz-Sureste Basins, in partnership with Geokinetics, and over 4,500 km of 2D seismic data in the Tampico-Mislanta Basins which is being reprocessed and interpreted entirely within TGS.he data selected for this package is designed to provide a regional subsurface framework from the Sierra Madre foothills through the marine transition zone in this prolific Mexican oil and gas production region. 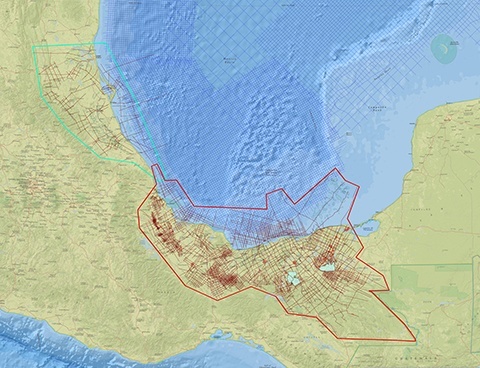 The data selection for these packages is designed to provide a regional subsurface framework from the Sierra Madre foothills through the marine transition zone in this prolific Mexican oil and gas production region. The objective of this project is to provide the industry with high-quality data to evaluate lease rounds in the CNIH 5-year plan. The Sureste region is currently Mexico’s most productive petroleum province. It holds vast untested and undeveloped opportunity. Multiple tectonic episodes have resulted in complex overlapping structural styles and a wide range of proven and potential plays. Massive structures along the leading edge of the Sierra Madre and Chiapas thrust belts produce oil from Upper Cretaceous carbonates and Jurassic oolites. Eocene carbonate breccias derived from Mezosoic thrust sheets produce in several fields. Linked extensional and compressional tectonics and salt mobilization in the Miocene formed massive traps including the 37 billion-barrel Cantrell complex in the Bay of Campeche. Salt tectonics offshore and onshore also formed abundant traps in the Mesozoic and Tertiary section. Plio-Pleistocene extension in the near-shore salt province formed multiple deep mini-basins which hold significant potential. View data in our interactive map. The Veracruz region features plays along the Cretaceous-Eocene Sierra Madre thrust belt and its Tertiary foreland basin to the east. Stacked thrust sheets of Cretaceous carbonates form multiple traps with numerous proven fields and prospective oil plays. The foreland basin is a significant gas province where structural inversion occurred in the mid to Late Miocene, with Miocene debris fans and turbidite sands producing from massive pop-up structures. The deeper strata remain largely unexplored. The map above shows the general coverage of the 2D selected for reprocessing in the Sureste-Veracruz basins. View data in our interactive map. The package highlights the geologic diversity in structural styles and depositional environments of the Tampico-Misantla Basin. The basin contains the historic Golden Lane trend producing from the karsted carbonate rim of a massive Cretaceous atoll. The adjacent Poza Rica trend, one of the largest stratigraphic traps in the world, consists of large aprons of basin floor debris fans of carbonate breccia derived from the crest of the reef. The basin contains multiple Tertiary paleocanyons; the Chicontopec formation is found in the foothills of the Sierra Madre and produces from both stratigraphic and structural traps. In the Northern basin, broad late and middle Cretaceous structures contribute significant production. Triassic to Jurassic rifting has produced enormous basement blocks and half grabens with underexplored Cretaceous and Jurassic structures. The Jurassic Pimienta Shale is a world class source rock that sources Tampico Petroleum system and now presents itself as an emerging shale play. View data in our interactive map. The map above shows the general coverage of the reprocessed 2D package in the Tampico-Misantla basin (blue polygon). TGS and Geokinetics are also processing more than 40,000 linear kilometers of CNH data in the Sureste/Veracruz area (outlined in red). The most comprehensive and continuous Offshore Mexico dataset available. Only from TGS. TGS' data packages can be used to build a subsurface geological framework for regional as well as detailed local evaluations. Our data provides the foundation for stratigraphic and petrophysical models. With such diversity of available products, exploration, A&D, and new venture teams are seeing the biggest immediate benefit from Mexico well data sets.